Environmental Planning services offered by D&D Larix, LLC, address a broad range of planning needs. We use a variety of assessment tools to discover answers and find “unknown questions“. Advanced hazard mitigation assessments and environmental management analyses are combined with our natural resources familiarity. However, familiarity does not give us answers to all problems we face. Sometimes, the challenges we face truly confront our experiences. That is where we have experience to dig deeper to discover answers. Oftentimes, those solutions are found by our specialists, sometimes by the professionals of our clients. Other times, the solution is discovered by bringing in others specialists with different expertise. It is very common that additional “thinkers” brought into the situation can spur the resolutions we seek. integration of human habitation with these elements. Environmental Planning has information to be discovered using a wide range of possible devices. Many of those devices are tools, but all are activated by the minds of investigators who make it meaningful. anthropogenic influences across the landscape. Shoreline Management Planning seeks surface waters are maintained to preserve and enhance the structure and function of aquatic and wildlife. Planning efforts desire to restore and maintain the chemical, physical, and biological water integrity, to preserve and enhance the environment. Actions by people may cause the introduction of pollution or contamination substances to surface waters. The degradation of aquatic habitat extends from the quality of water to the impacts to shorelines. These impacts include near-shore soil impacts and the riparian vegetation density and composition. This assessment and planning can be conducted along streams and rivers in what are commonly known as riparian zones. These zones are those areas most closely located next to moving water – but not exclusively. Evaluations are often conducted along lake shorelines to extend to the in-flowing streams and outbound rivers. Comprehensive evaluations of shorelines extend to the ocean shorelines of jurisdictions. 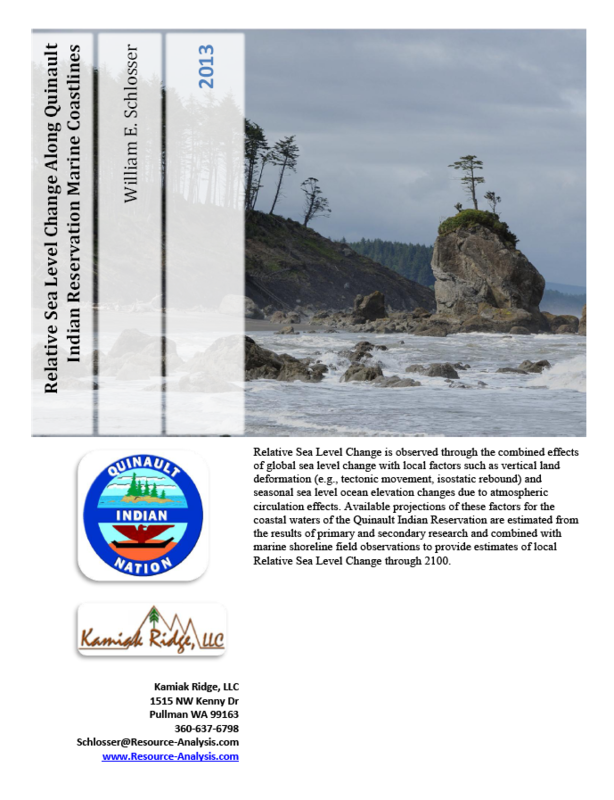 Discussions include not only topographic and soil-chemical interactions, but also global climate change influences of changing sea-levels. If your jurisdiction is located along the ocean shorelines and sea-level is anticipated to rise, then concrete actions are necessitated. 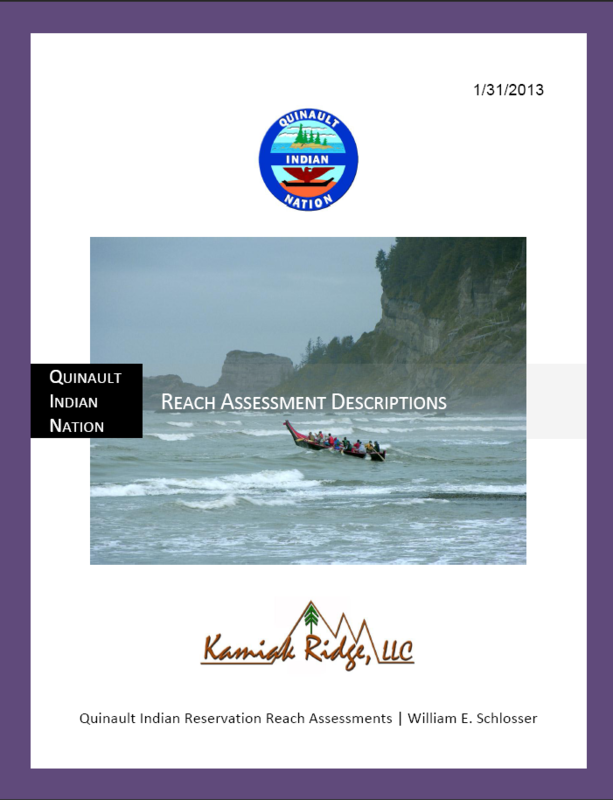 These challenges were presented as we worked with the Quinault Indian Nation to assess their ocean shorelines. 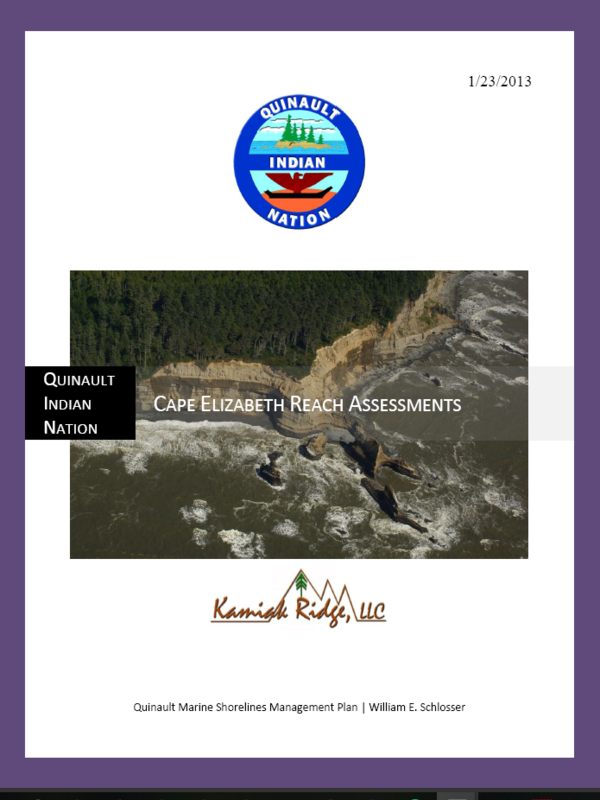 The Environmental Planning analysis documented current conditions and changes recorded along the reservation’s shoreline interface with the Pacific Ocean. A record of geologic, photographic, tectonic, vegetative, and spatial conditions formed the basis for a starting point. Numerous potential responses were considered. A few assessment documents are presented here to see example of the considerations made for shoreline management plans. The documents linked here show the primary guide and discussions about the environmental planning and assessment approaches used. The Assessment Descriptions and the Assessment imagery shows how certain insights were confirmed across this region. Some of the aerial photography used was obtained from 1930. Military base records were obtained from Freedom of Information Act (FOIA) requests to verify construction activities made on these sites. These images were geospatially rectified to confirm how physical site characteristics responded to anthropogenic influences through a hundred-year period. The aerial imagery from 1935 at Cape Elizabeth confirms a World War II U.S. military base. 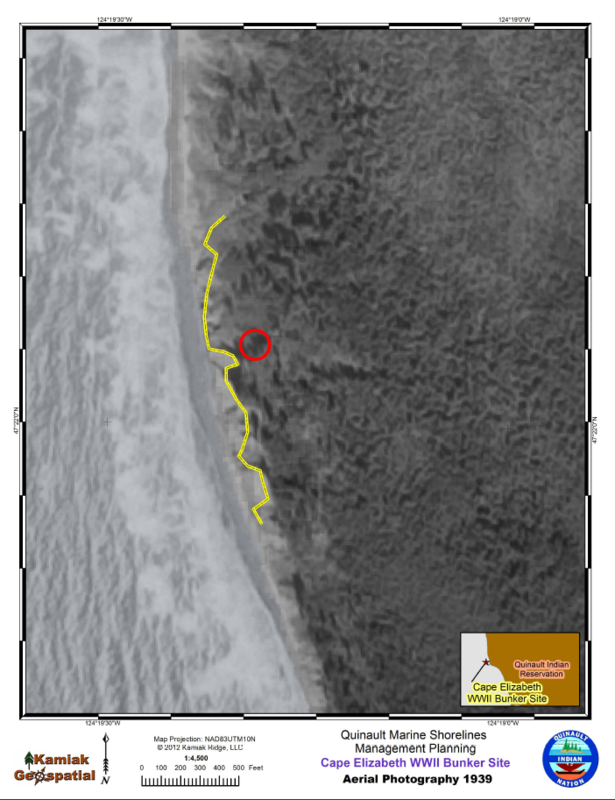 It was established on the “Quinault Indian Reservation” to spot possible attacks from sea. The ocean shoreline substrate materials of this zone were formed through an accretionary wedge. The Juan de Fuca plate subducted against, then below, the North American plate. Materials forming these cliffs could not sustain compaction without compromising substrate stability – cliffs avulsed into the ocean. The military base above Cape Elizabeth collapsed into the ocean shoreline by 1965. This is a fate which each human development along this shoreline must recognize.